The Suspension Bed is simply a butterfly chair for cats and small dogs. It is a lot like a hammock to your little friend. It has steel frame that holds up the cotton/polyester cover. The cover can also be removed for easy washing if this becomes necessary. One of the great features of this product is that it can be folded up in an instant and stored in seconds! Another plus is that it comes with a fishing pole style toy so your feline friends can entertain themselves while lounging. What more could a cat want? David bought 2 of these and gave the second to Donna's kitties. They had the exact same problem that we did. Our only complaint is that the rear of the chair is not balanced well. If I lean back and put my weight on the back part of the chair it will flip over. With general use I do not do this, but when playing with the pole toy on the chair or sitting in it and leaning over the rear side the chair flips easily. David resolved this issue by backing the chair against something. For a while it was the wall, then he moved the chair in the living room and backed it against the coffee table. With this resolution in place the chair is great. If the chair is placed directly over a heating vent, watch out! It becomes a wonderful place and Itchy and I would both like to lay in it all day! When placed in the sun Leo likes to lay the afternoon away in the chair. So if you want to live your feline friends a great new chair that is like a hammock, and can live with the possibility of it flipping over, then this is the chair for feline kings! Pros: Comfy, fun to play with toy, easy to clean. Cons: Balance issues if weight is placed toward the rear back. Over all it is a good design, not perfect, but acceptable. If it only had a center pole off the back to hold it in place it would be purrfect. We would recommend it though. 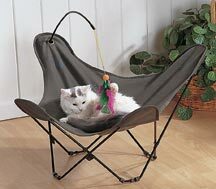 And if you do not put the pole toy in place your feline friend may not be inclined to recline and flip the chair over! The Suspension Bed can be ordered from www.DrsFosterSmith.com.